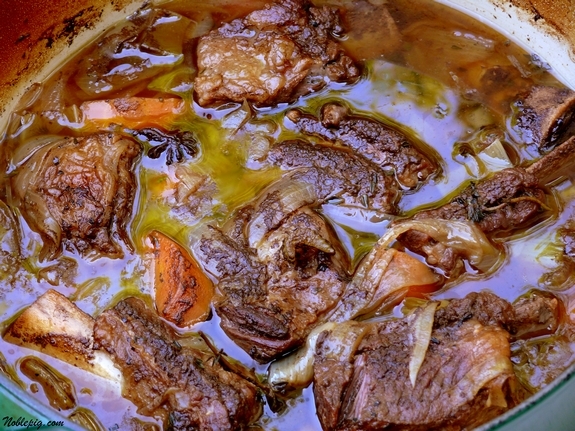 How I love braised short ribs, let me count the ways…. When it comes to short ribs, the secret is in the sauce and this creative twist using root bee rmakes it well worth the time it takes to braise. The sweet and spicy root beer really enhances the meatiness of the ribs. We loved it. The sauce reduces to this really concentrated sweet and savory combination full of flavor. Of course the meat just falls of the bone and goes perfectlywith mashed potatoes. Mashed sweet potatoes would also be a nice side dish to incorporate as well. My oldest son ate two or three ribs before he asked what kind of sauce I had made. WhenIexplained tohim it was root beer sauce, he couldn’t have been happier. This is definitely a meal we will make again and again. I bet you will too. Preheat oven to 275o F. Season ribs generously with salt and pepper. In an 8-quart Dutch oven or heavy pot, heat oil to high. In batches, brown ribs on all sides, about 20 minutes total. If oil gets too dark during browning, pour off and add more oil (do not wipe pot clean). Transfer ribs to a plate and pour off all but 2 Tablespoons fat from pot. 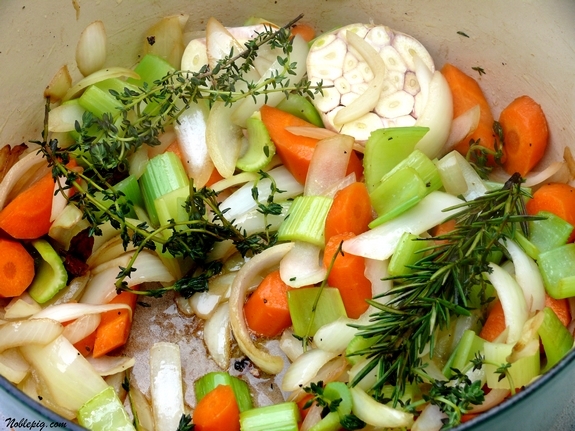 Add onions, celery, carrots, garlic, thyme, bay leaves, rosemary, cumin and star anise. Cook, scraping up any browned bits, until onions are soft, 5 minutes. With a slotted spoon, transfer ribs to a large straight-sided skillet; discard solids by pouring/straining liquid through a fine-mesh sieve. Skim off fat from cooking liquid. If you have time, place liquid in the refrigerator for a little while, making it easier to discard the fat that will accumulate on top. Boil liquid and ribs over medium-high heat until liquid is reduced by half (I think I went even a little further to get it thicker), about 20-30 minutes. While boiling, periodically spoon liquid over meat, until ribs are glazed and sauce is thickened. Season to taste with salt and pepper. Return ribs to pot and add broth and root beer. Bring to a rapid simmer, cover, and place pot in oven. Cook until meat can be easily pierced with the tip of a pairing knife, about 3 hours. (To store, refrigerate, up to four days if you choose.) With a slotted spoon, transfer ribs to a large straight-sided skillet; discard solids by pouring/straining liquid through a fine-mesh sieve. Skim off fat from cooking liquid. If you have time, place liquid in the refrigerator for a little while, making it easier to discard the fat that will accumulate on top. 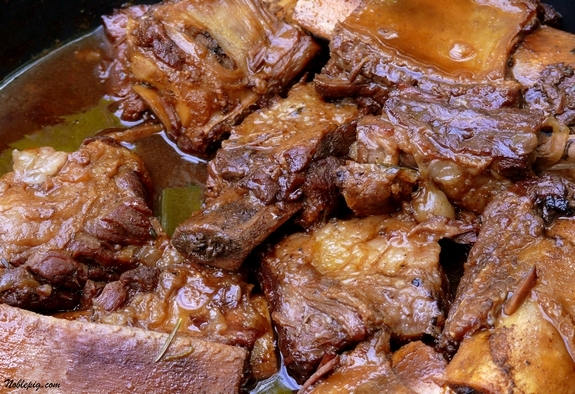 You can cook the short ribs up to four days ahead; Refrigerate, then skim, strain and reduce the cooking liquid before serving. This is a keeper – delicious – sweet, succulent. This is an incredible recipe, what a cool idea. mmm. short ribs! Isn’t there also a recipe that calls for coca-cola? What a yummy-looking and interesting recipe!! This sounds like Sunday dinner to me! I can’t help it, I’m drooling at the thought of this. I’m also presuming the quality of the rootbeer would have a direct effect on the results, no? I’m thinking one of those locally brewed sasparillas might be fantastic in this. These look so good! I’ve sweetened ribs many times but never with rootbeer! Short ribs are just flat out good. Saving this recipe. I love it that you can make them up ahead of time and they look really succulent. We might have to have this tomorrow night. I also think the rootbeer will add a nice zip to the flavor. Excellent! Wow, I never would have thought to use root beer – delicious! I bet the sauce with the mashed potatoes would be amazing!! girl….you are a genius. love love love this. i can only imagine the taste and what the house smelled like. I am so impressed with this dish! I have never made short ribs, always wanted to try, and so next time I will include the root beer in the mix! I don’t like to drink it but I bet it adds a lot of flavor! Great recipe! Thanks! 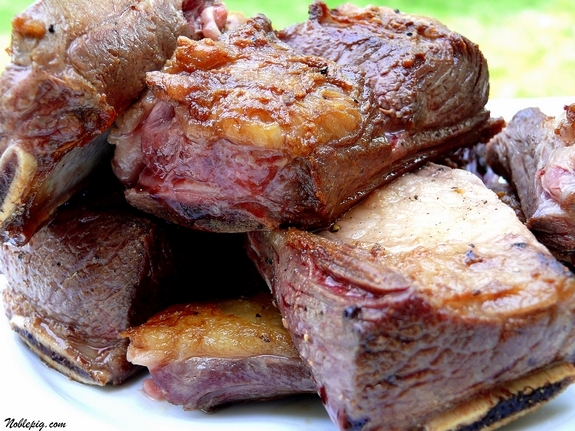 Love short ribs, these look wonderful. Thanks. Well, my real problem would be having enough root beer to get it into the PAN instead of into me! Oh my, you have the best recipes. I need to rename my blog *Noble Pig’s Recipes tried again* I think you are my hero! NO, I know your my hero!!! I know short ribs are thought of as “winter” food, but I adore them and can eat them at any time of year. I haven’t tried making them in the slow cooker yet; that’s my next frontier to conquer. Sounds delish! I love shortribs, especially with the mashed spuds. Sounds like heaven on a plate! Oh my, these ribs look amazing! I would never have thought of using root beer, but I know my family will love it.I’ve bookmared it to try soon! Such amazing flavors with root beer, yum! i can’t tolerate root beer by the bottle, but i’m sure i could handle it like this quite nicely. talk about your fall-off-the-bone ribs! I’ve used cola before but not root beer. I really must give it a try. These ribs look absolutely delicious. We’re having some later this week too, but cooked in Zin. Love dem ribs! These look absolutely fabulous!!!!! I won’t tell my hubby what the ribs are cooked in though as he can’t stand root beer, like most Brits! That looks so good, all the yummy sauce over the potatoes…yum! Yum! I haven’t tried root beer with short ribs yet. Excellent idea! I know my husband would be in love with this! I found you via StumbleUpon. I look forward to visiting your blog. I’m kindda new to the whole blogging thing. But I’ve shared you with my followers because I think you have an awesome blog. Much Love to you and your family. Oh I can’t wait to make these. I bet the reduction of the rootbeer is divine! I’ve never been successful with ribs, I think with this recipe I could be! I love that they are cooked slowing in the oven for a few hours. I love short ribs and the addition of root beer is awesome. My meat loving boys would die over this dish. Holy crap, that looks wicked good. 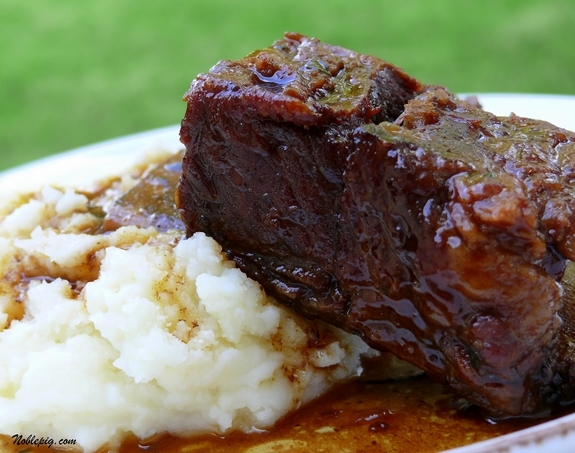 I’ve never made braised short ribs, but these make me want to! So interesting! I can imagine the flavors, and the root beer must have been great with the slow-cooked beef. I’m salivating. Ribs are going on my shopping list and I’m breaking out the mixer for some foccacia bread. Thank you! I always pour one of those 100 calorie cans of Dr. Pepper in the two-person beef stew I make for my husband and me. It gives the it a dark, almost fruity richness. Love it. These look AWESOME. Definitely trying root beer in my next batch. Bookmarked! I am making this recipe…my kids love root beer and ribs so this is perfect for us. I’ve never made short ribs before but I know that my son and my husband love them. And, they both love Root Beer! Bookmarking now! Yikes, I have so many recipes to catch up on! 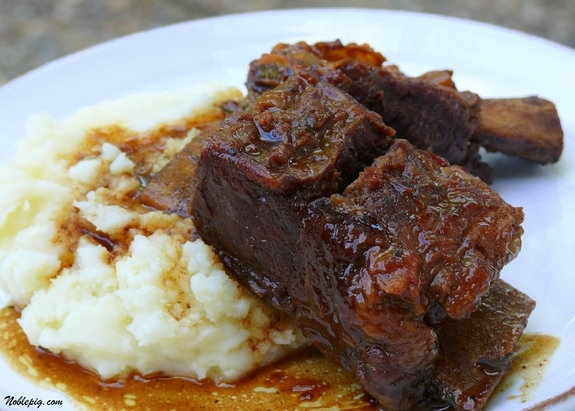 These look awesome…I love me Short Ribs!! Better find some time to do some cooking! I am new to your blog and I LOVE iT! Question; my family doesn’t like short ribs! AAAUGH! What other meat could I use? I can’t imagine anything else. I tried this recipe. I loved the sweet and savory combo. I thought 4.5 lbs of meat was a bit much, but once you cook the meat and the fat dissipates you have 6-8 servings or enough leftovers for a week. This recipe is a keeper. Mmmm,mmm, good! Years ago, I had a pork roast made with rootbeer and it was terrific. Your photos make this look like a winner, too. YUM! Tried this recipe, tasted great (and I don’t even like Root Beer), and my husband loved it too. Do you think this would work with diet root beer? Wow, that looks completely amazing. This was a great commentary. You vastly helped my research much quicker. mmmm do you think I could make them in a crockpot? I’ve been waiting to try this recipe for a while. Has anyone used a pot v.s. a dutch oven? Does it make that much of a difference? Has anyone cut the recipe? Tips? I’d really like to cut this recipe in half…besides cutting the ingredients in half…should I adjust the time? Since I haven’t tried it…..?? But for tenderness I would cook the same amount of time. This is in my oven right now and OMG I AM DYING over the insanely good smell. Thanks for sharing! LOVE..LOVE…love ribs made this way! I actually used Diet DP…and they were awesome! My husband moaned….the entire meal with delight! I used your recipe for our Christmas Eve dinner last night. The ribs were amazing!! So tender. I used a different recipe for the other half of ribs and made them in a slow cooker. Everyone ate the ribs from your recipe and didn’t touch the others from the slow cooker! Thank you for sharing! Roast Beef is awesome with root beer! I can’t find where to print this recipe. I would love to save it, but I need to print it. It sounds like an incredible recipe and I can’t wait to try it. Copy and paste the recipe into a Word document is the easiest way. I am making the root beer short ribs now. Wish me luck! Have you tried this with the ” alcoholic root beers” Like Not My Fathers? I was wondering if the alcohol would help tenderize the meat. I have not. The meat will not need to be tenderized, it will fall off the bone using this method. Great recipe. Have cooked in the oven and also the pressure cooker (when I was running out of time). Equally as good. Have cooked with a good quality Sarsaparilla and and then also a black beer. Like both. Personally I’m not fussed on taste of star anise & will cut back next time. These are cooking right now and I cannot wait to try them. I’m certain the star anise will really make the root beer flavor pop.